← Billy Ocean at Hoosier Park Friday! 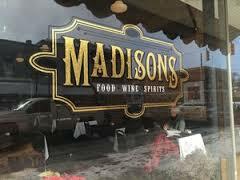 This entry was posted in In Our Community and tagged cuisine, dine downtown Pendleton, dine local, dining at Madisons in Pendleton, downtown Pendleton, European cuisine, Madisons, Madisons restaurant, Pendleton, Pendleton eateries, Pendleton Madisons Restaurant, Pendleton restaurants, support local Pendleton restaurants, where to dine, where to eat. Bookmark the permalink.